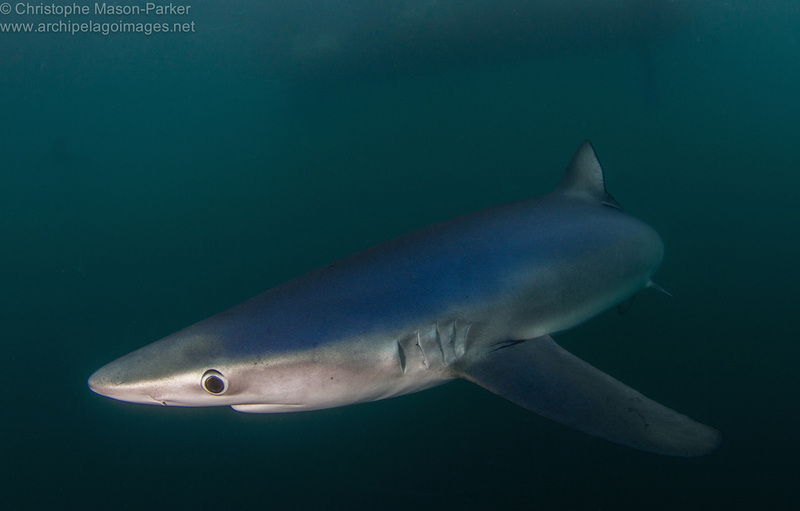 On the morning of Wednesday August 20th, we boarded Charles Hoods' brightly coloured rib and set off into the English channel in search of Cornish Blue sharks. The weather the previous week had been less than ideal, with strong winds and torrential rain having led to a number of trips having been cancelled. This was our only window of opportunity and thankfully the weather gods had decided to smile upon us for the day, as the sun made an appearance from behind the low-lying clouds. After an hour's journey out to sea, we stopped at an indecipherable location, which Charles assured us had produced excellent shark encounters on previous occasions. A home-made chum concoction was then dangled over the side of the rib to inform any nearby sharks of our location. Aside from the appearance of two common dolphins next to the boat, the next 90 minutes passed without incident. Then suddenly, and just as we were beginning to lose patience, the first shark appeared. 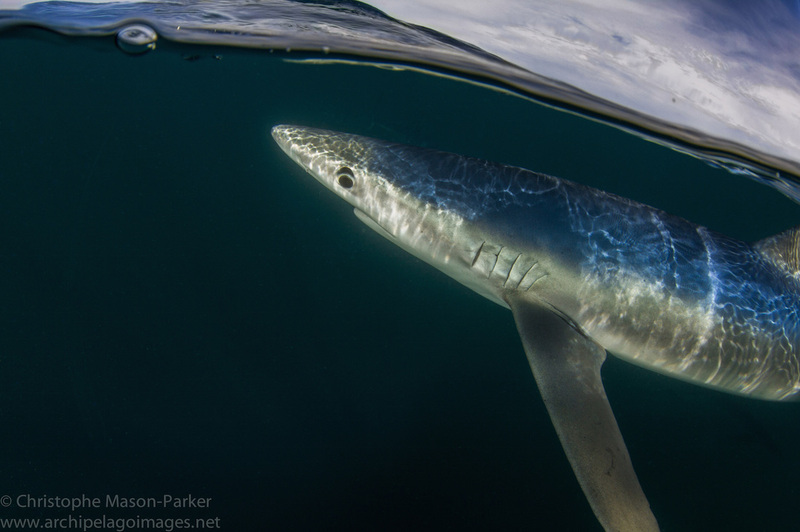 Long and slender with an iridescent blue dorsal surface, the 2m shark glided effortlessly through the water and up to the side of the rib. Within minutes we were in the water and face to face with these amazing creatures. Over the course of the afternoon several sharks appeared around the boat and at no point did they leave us entirely. At times there were at least seven sharks in the water ranging from around 1m to 2.5m in length. They were extremely inquisitive, often bumping my housing port but at no point did they exhibit threatening behaviour. 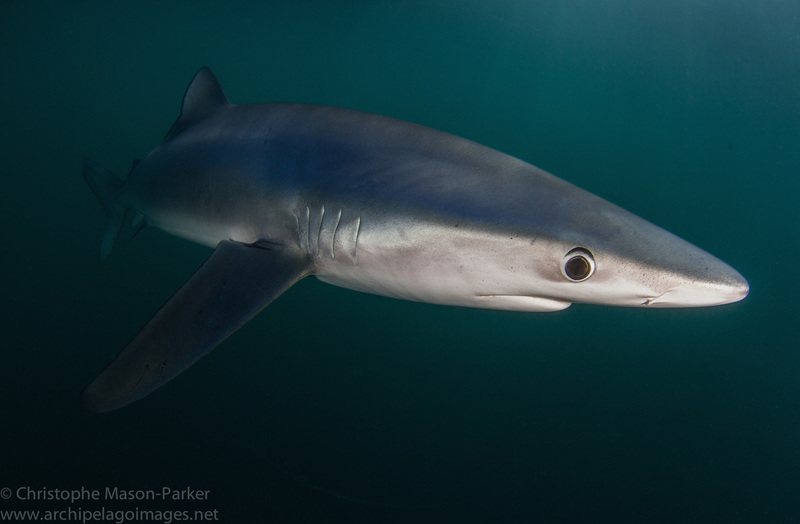 The blue shark (Prionace glauca) is found in both temperate and tropical waters. They have long thin bodies and are counter-shaded with a deep blue dorsal surface and lighter underside. 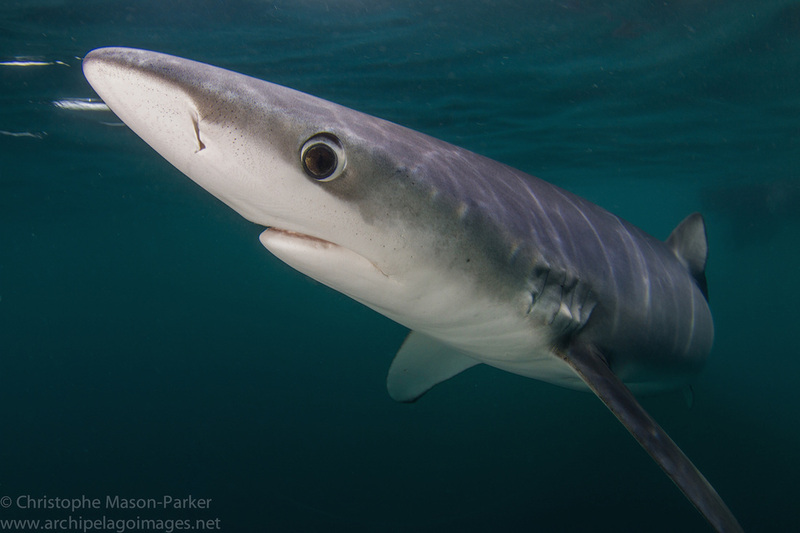 They feed on a diet of fish and squid and grow to over 3m in length. 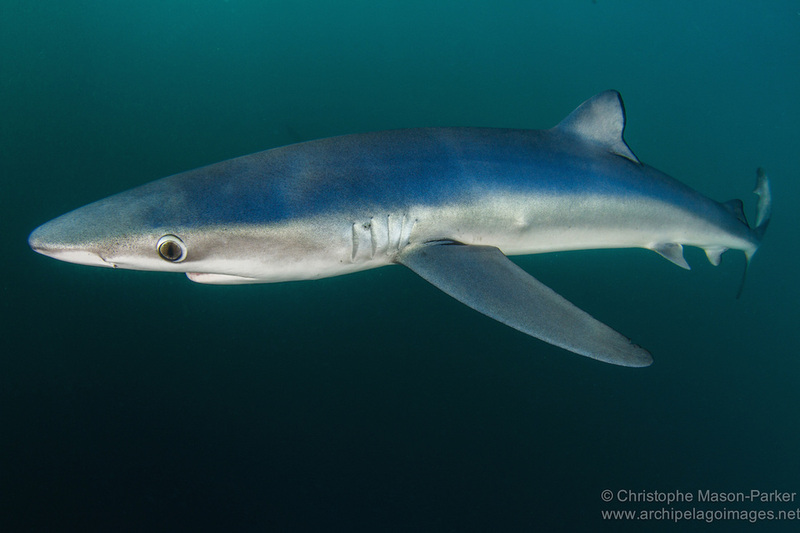 A close up of the front of a blue shark provides a view of the Ampullae of Lorenzini. These specialised sensory organs act as electroreceptors enabling the shark to detect electric fields in the water and assist with targeting prey. 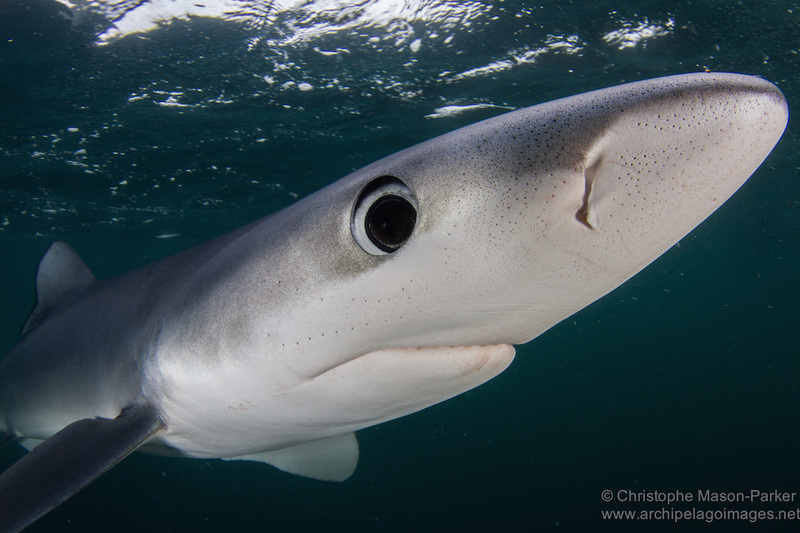 A young blue shark peers into the camera lens. 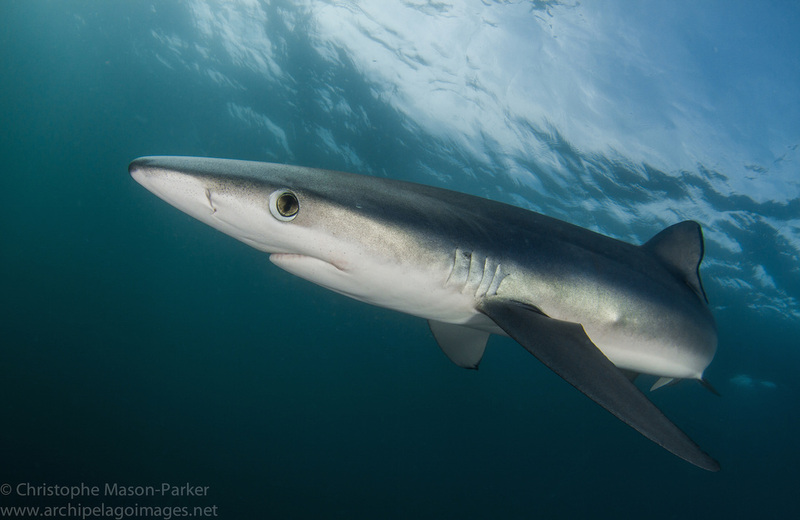 Globally blue shark numbers have declined drastically as a direct consequence of the shark fin trade. They are listed on the IUCN Red list as near threatened. 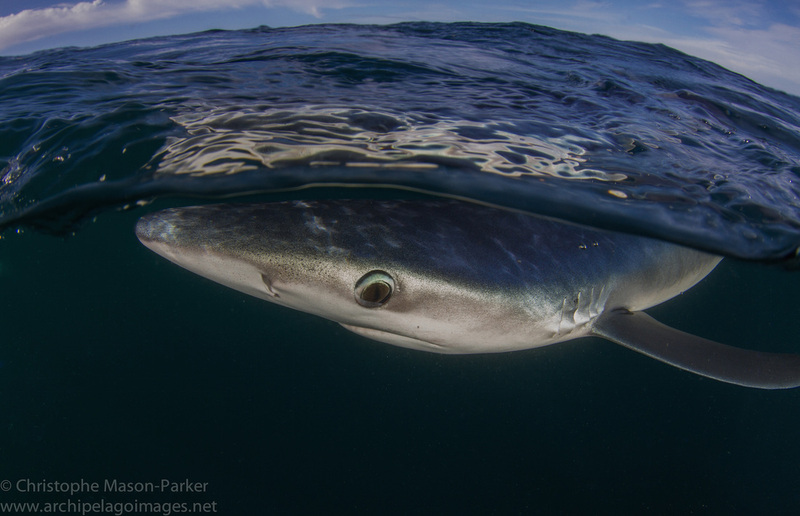 A 2m blue shark moves silently through the water beneath the rib. 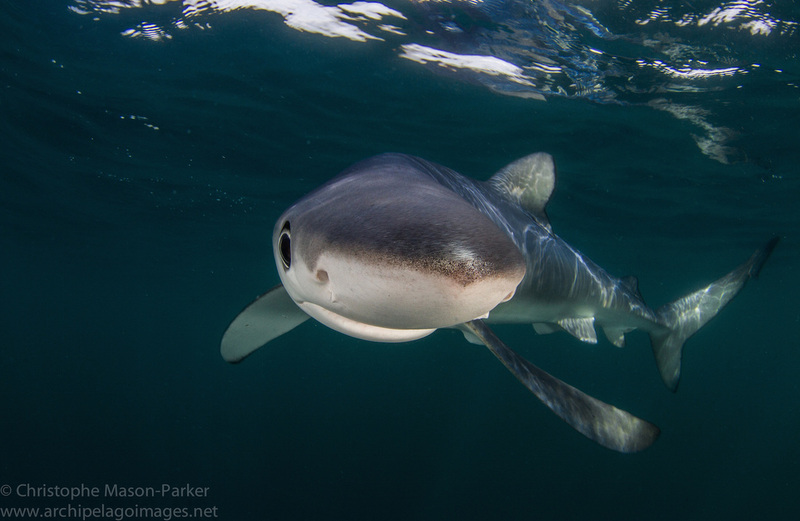 The sharks were extremely inquisitive, coming right up to the dome port before stopping and eyeballing the camera equipment.